Ayatullah Khoie considers it 'Ehtiyat e Wajib' to attend the Juma prayers, if all conditons are established ,while Ayatullah Sistani considers it as 'Wajib Takhyiri' (ie You have an option to choose between Friday & Zuhr ,though Friday prayer is preferred ) . 740. * Friday prayers consists of 2 Rak'ats like Fajr prayers. The difference between these two prayers is that Namaz-e-Jumuah has two sermons before it. Namaz-e-Jumuah is Wajib Takhyiri, which means that we have an option to offer Jumuah prayers, if its necessary conditions are fulfilled, or to offer Zuhr prayers. Hence, if Namaz-e-Jumuah is offered then it is not necessary to offer Zuhr prayer. .^. The time for Jumuah prayers should have set in. And that means that the midday time should have begun to decline. The time for Namaz-e-Jumuah is the earliest part of Zuhr. If it is very much delayed, then Namaz-e-Jumuah time will be over, and Zuhr Namaz will have to be prayed. .^. The number of persons joining Namaz-e-Jumuah should be at least five, including the Imam. If there are less than five people, Namaz-e-Jumuah would not become obligatory. .^. The Imam should fulfill the necessary conditions for leading the prayers. These conditions include righteousness ('Adalat) and other qualities which are required of an Imam and which will be mentioned in connection with the congregational prayers. In absence of an Imam qualifying to lead, Namaz-e-Jumuah will not be obligatory. .^. The prayers should be offered in congregation. Hence, Namaz-e-Jumuah cannot be prayed alone. If a person joins Namaz-e-Jumuah before the Ruku of the second Rak'at his prayers will be valid and he will have to add another Rak'at to complete it. But, if he joins the Imam in the Ruku of the second Rak'at then the prayers may not suffice, and as a measure of precaution Zuhr Namaz should be prayed. .^. Two sermons should be delivered before the prayers. In the first sermon the preacher should praise Allah and exhort the people to observe piety, and then he should also recite a short chapter (Surah) from the holy Qur'an. Thereafter he should sit down for a while and then stand up again. This time also he should praise Allah and invoke peace and blessings upon the holy Prophet and the holy Imams and, as a recommended precaution, seek forgiveness for the believers. It is necessary that the two sermons should precede the Namaz. It will not be correct to offer the prayers before the two sermons. And, it is not permissible to deliver the sermons before Zuhr time has set in. It is also necessary that the preacher should be standing while delivering the sermons. Hence, if he delivers sermons while sitting, it will not be in order. It is also necessary and obligatory that there should be a break between the two sermons by way of sitting down during the interval for a while. It is also necessary that the preacher who delivers the sermons should also lead the prayers. Taharat may not be a condition for delivering the sermons, but as a precaution, it should be maintained. As far as the glory of Allah, invocation of prayers and mercy upon the Prophet and the Imams are concerned, it must be rendered in Arabic, but the rest of it need not be in Arabic. In fact, if the majority in the audience are non-Arabs, then as an obligatory precaution, words of admonition and exhorting people to be pious and virtuous should be delivered in their language. .^. The distance between the two places where Namaze-Jumuah are offered should not be less than one Farsakh (3 miles). Hence if the distance between the two places is lesser and both the prayers commence at one and the same time both will be void. And if one of those prayers precedes the other (even to the extent of Takbiratul-ehram i.e. the first Takbir) the one which precedes will be in order and the other will be void. If, it transpires after the Namaz-e-Jumuah is over that another Namaz-e-Jumuah had commenced earlier or simultaneously at a distance of less than farsakh, it will not be obligatory to offer Zuhr prayers. It is immaterial whether this information is received within the time or later. Moreover, a Namaz-e-Jumuah can stop another from being held within the stipulated distance only if it is itself valid, comprising of all conditions, otherwise it cannot have any prohibitive effect. 741. * When Namaz-e-Jumuah, with all its requirements is held, it will be obligatory to attend it if one who established it is Imam (A.S.) or his representative. But in a situation other than this, joining or attending it is not obligatory. .^. The person joining should be man. Presence in Jumuah prayers is not obligatory for women. .^. Freedom. Hence it is not obligatory for a slave to be present in Jumuah prayers. .^. Not being a traveller. Hence Jumuah prayers is not obligatory for a traveller, regardless of whether the traveller prays Qasr or full prayers, as he would do if he intends staying for 10 days or more. .^. Being free from ailment and blindness. Hence it is not obligatory for a sick or a blind man to offer Jumuah prayers. .^. Not being old. Hence Jumuah prayers is not obligatory for old men. .^. That the distance between the place a person is and where Jumuah prayers is going to be held should not be more than 2 farsakh (11 Km) and it would be obligatory for a person who is at the end of 2 farsakh to join the Namaz. And similarly, participation in Jumuah prayers will not be obligatory for a person who finds it extremely difficult, because of rains, severe cold and so on. .^. It is permissible for a person, who is exempted from Jumuah prayers, and for whom presence in Jumuah prayers is not obligatory, to hasten for Zuhr prayers in the early part of its time. .^. It is Makrooh to talk while Imam delivers the sermon. And if the noise created by talking prevents others from listening to the sermon, then it is haraam, regardless of whether the attendance is the minimum required or more. .^. As an obligatory precaution, it is wajib to listen to both the sermons. However, listening to the sermons is not obligatory upon those, who do not understand their meanings. .^. The second Adhan on Friday is an innovation. And it is the same Adhan which is usually called the third Adhan. .^. It is not obligatory for a person wishing to join Jumuah Namaz to be present while Imam is delivering the sermon. .^. Conducting purchase and sale at the time when people are called to Jumuah prayers is haraam, if it hinders the prayers, and not if it does not hinder. And in spite of it being haraam, the transaction done would not be void. .^. When it was obligatory for a person to be present in Jumuah prayers and he abandoned it, and offered Zuhr prayers, his prayers would be in order. Q24: Does performing Friday (jumu'ah) prayer compensate for noon (zuhr) prayer or not? Is Friday prayer superior to the noon prayer? Q25: Is one entitled to object to the holding of Friday prayer by claiming that the marjas of the Muslims in Najaf and Qum do not establish it, while knowing that in the city in which the mukallaf resides, most of the residents perform Friday prayer on the basis of their fiqh? Q. Please, advise whether presence of female congregants would make up the requisite number of persons necessary for the Friday Prayer to be established. A. It is allowed to calculate males and females to reach the minimum number which is 5 [including the male Imam] to perform Salaatul Jumu’ah. Q. How long can Salaatul Jumu’ah be delayed for? 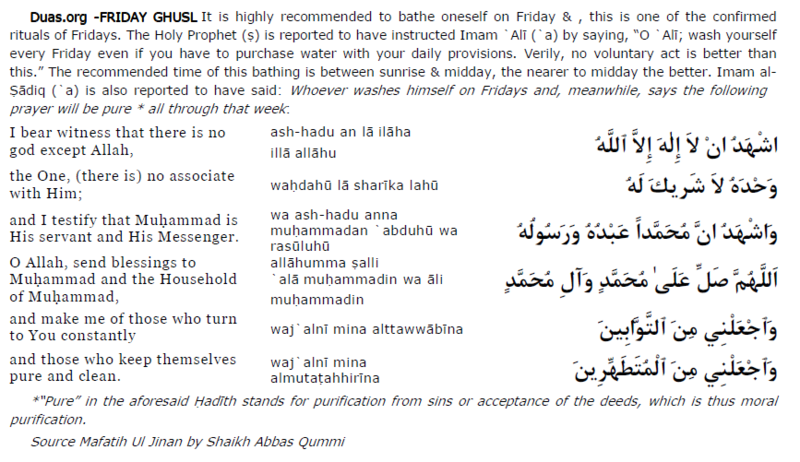 A. Salaatul Jumu’ah cannot be delayed per se. However, if it is established later than the actual time, the delay period will depend upon ‘urf. That is to say, customarily the community decides what constitutes delay. Q. During Salaatul Jumu’ah, is it permissible to establish Salaatul Dhuhrayn simultaneously, either individually or in congregation? A. On Fridays, Salaatul Jumu’ah and Salaatul Dhuhrayn are optional obligatory. So, if Salaatul Jumu’ah with all its required conditions is established, then one has to join in and cannot pray Dhuhrayn simultaneously. Friday prayer consists of 2 rakats like Fajr prayer. The difference between these two prayers is that Namaz-e-Jumuah has two sermons before it. Namaz-e-Jumuah is Wajib Takhyiri, which means that we have an option to offer Jumuah prayers, if its necessary conditions are fulfilled, or to offer Zuhr prayers. Hence, if Namaz-e-Jumuah is offered then it is not necessary to offer Zuhr prayer. 1. The time for Jumuah prayers should have set in. And that means that the midday time should have begun to decline. The time for Namaz-e-Jumuah is the earliest part of Zuhr. If it is very much delayed, then Namaz-e-Jumuah time will be over, and Zuhr Namaz will have to be prayed. 2. The number of persons joining Namaz-e-Jumuah should be at least five, including the Imam. If there are less than five people, Namaz-e-Jumuah would not become obligatory. 3. The Imam should fulfill the necessary conditions for leading the prayers. The prayer should be offered in congregation. Hence, Namaz-e-Jumuah cannot be prayed alone. Two sermons should be delivered before the prayer. The distance between the two places where Namaz-e-Jumuah are offered should not be less than one farsakh (3 miles). Hence if the distance between the two places is lesser and both the prayers commence at one and the same time both will be void. And if one of those prayers precedes the other the one which precedes will be in order and the other will be void. 1. The person joining should be man. Presence in Jumuah prayer is not obligatory for women. 2. Freedom. Hence it is not obligatory for a slave to be present in Jumuah prayer. 3. Not being a traveler. Hence Jumuah prayer is not obligatory for a traveler, regardless of whether the traveler prays Qasr or full prayers, as he would do if he intends staying for 10 days or more. 4. Being free from ailment and blindness. Hence it is not obligatory for a sick or a blind man to offer Jumuah prayer. 5. Not being old. Hence Jumuah prayer is not obligatory for old men. 6. That the distance between the place a person is and where Jumuah prayer is going to be held should not be more than 2 farsakh (11 Km) and it would be obligatory for a person who is at the end of 2 farsakh to join the namaz. It is permissible for a person, who is exempted from Jumuah prayers, and for whom presence in Jumuah prayers is not obligatory, to hasten for Zuhr prayers in the early part of its time. It is makrooh to talk while Imam delivers the sermon. As an obligatory precaution, it is wajib to listen to both the sermons. However, listening to the sermons is not obligatory upon those, who do not understand their meanings. The second Adhan on Friday is an innovation. And it is the same Adhan which is usually called the third Adhan. Salãtu ’l-Jum‘a: Whether or not it is wãjib? During the ghaybat (Occultation) of the Present Imam al-Mahdi (a.s.), the Friday Prayer is wãjib takhiyri. What does “wãjib takhiyri” mean? It means that you have a choice between two obligatory deeds: you must do one of them, you cannot miss both. In our case, it means that you have the duty of doing either the Noon Prayer or the Friday Prayer. However, it is preferable to do the Friday Prayer. And when you do the Friday Prayer, then you will do it with the niyyat of wãjib; and after that you do not have to recite the Zuhr Prayer. 2. On Whom is Salãtu ’l-Jum‘a Wãjib? The Friday Prayer, in its wãjib takhiyri form, is wãjib upon the men who are resident of that city, in good health, and not elderly. The Friday Prayer is not wãjib upon the women, the traveler, the sick, and the elderly. HOWEVER, this does not mean that they are not allowed to participate in the Friday Prayer; it only means that they are exempted from participating in the Friday Prayer. Considering the Friday Prayer as the most important weekly religious event in a non-Muslim country, it is preferable for the women, the traveler, and the elderly to participate in the Friday Prayer provided it does not cause any inconvenience to them. The niyyat for these exempted people will still be the niyyat of wãjib when they participate in the Friday Prayer; and they do not have to say the Zuhr after it. 3. Friday Prayer led by a Sunni Imam. If there is no Shi‘a centre or mosque near your home or work-place, then you can participate in the Friday Prayer led by a Sunni imam. However, in this case, you will also have to recite the Zuhr Prayer after it. One of the conditions for the imam of jamã‘at, in Shi‘a fiqh, is that the imam must be ‘ãdil (of upright character) and Shi‘a Ithnã-‘Ashari. 4. What If I Missed the Khutbas before Jum‘a? The two khutbas (sermons) delivered by the imam of jum‘a are essential parts of the Friday Prayer ceremony. The audience is required to listen to the khutba, and not engage in any other activity, not even doing the nãfila/sunnat prayer. However, if a person missed the khutbas, he or she can still join the Friday Prayer and it will be considered sufficient. Remain silent when the imam is reciting the surahs. Straighten up the rows of jamã‘at. Do not recite the zikr so loud that the imam hears them. Hasten in filling the gaps when the iqamah is being recited. Do not go into the ruku or sujud before the imam. ash hadu anna Muhammadan 'abduhu wa Rasuluh. Alla humma salli 'ala Muhammadin wa Ali Muhammad waj'alni minat tawwabina waj'alni minal mutatahhirin. Muhammad and his Progeny. And make me one of those who are repentant and pure). Prior to the Friday Prayer, the Imam is supposed to deliver two sermons. The first sermon is regarding praise and glorification of the Almighty Allah and also to exhort the people piety and good deeds. The current affairs and most crucial issues of the Muslim society are also discussed in this sermon. Then a chapter of the Holy Quran is recited and the first sermon is concluded. After this the speaker sits down for a while, recites Salawat thrice and then stands up again to deliver the second sermon. الْحَمْدُ لِلَّهِ رَبِّ الْعَالَمِينَ. اللَّهُمَّ لَكَ الْحَمْدُ بَدِيعَ السَّمَاوَاتِ وَ الْأَرْضِ، ذَا الْجَلَالِ وَ الْإِكْرَامِ، رَبَّ الْأَرْبَابِ، وَ إِلَهَ كُلِّ مَأْلُوهٍ، وَ خَالِقَ كُلِّ مَخْلُوقٍ، وَ وَارِثَ كُلِّ شَيْ‏ءٍ، لَيْسَ كَمِثْلِهِ شَيْ‏ءٌ وَ هُوَ بِكُلِّ شَيْءٍ مُحِيْطٌ اَنْتَ اللهُ لآَ اِلٰهَ اِلاَّ اَنْتَ الْاَحَدُ الْمُتَوَحِّدُ الْفَرْدُ الْمُتَفَرِّدُ وَ اَنْتَ اللهُ لآَ اِلٰهَ اِلاَّ اَنْتَ الْكَرِيْمُ الْمُتَكَرِّمُ الْعَظِيْمُ وَ الصَّلٰوةُ وَالسَّلاَمُ عَلٰي مُحَمَّدٍ نَبِيِّ الرَّحْمَةِ سَيِّدِ الْمُرْسَلِيْنَ وَ عَلِيِّ ابْنِ اَبِيْ طَالِبٍ سَيِّدِ الْوَصِيِّيْنَ وَ فَاطِمَةَ الزَّهْرَآءِ سَيِّدَةِ النِّسَآءِ الْعٰلَمِيْنَ وَ حَسَنِ الْمُجْتَبٰي حُجَّةِ اللهِ عَلَي الْخَلْقِ اَجْمَعِيْنَ وَ الْحُسَيْنِ الشَّهِيْدِ الْمَظْلُوْمِ وَارِثِ اَمِيْرِ الْمُؤْمِنِيْنَ وَ عَلِيِّ بْنِ الْحُسَيْنِ زَيْنِ الْعَابِدِيْنَ وَ مُحَمَّدِ بْنِ عَلِيٍّ بَاقِرِ عِلْمِ الْاَوَّلِيْنَ وَ الْاٰخِرِيْنَ وَ جَعْفَرِ بْنِ مُحَمَّدِ نِ الصَّادِقِ الصِّدِّيْقِ وَ الْمُقْتَدِيْ بِاٰبَآئِهِ الصَّالِحِيْنَ وَ مُوْسَي ابْنِ جَعْفَرِ الْكَاظِمِ مِنْ اَوْلاَدِ النَّبِيِّنَ وَ عَلِيِّ ابْنِ مُوْسَي الرِّضَا مِنْ عِتْرَةِ بَرَرَةِ الْمُتَّقِيْنَ وَ مُحَمَّدِ ابْنِ عَلِيِّ الْجَوَادُ وَلِيِّ الْمُؤْمِنِيْنَ وَ عَلِيِّ بْنِ مُحَمَّدِ السِّرَاجِ الْمُنِيْرِ اِمَامِ الْخَاشِعِيْنَ وَ الْحَسَنَ بْنِ عَلِيٍّ سَيِّدِ الْاَوْصِيَآءِ الْمُنْتَجَبِيْنَ وَ الْخَلَفِ الْقَآئِمِ الْمَهْدِيِّ الْمُنْتَظَرِ الْحُجَّةِ بَعْدَ اٰبَآئِهِ عَلٰي خَلْقِكَ الْمُوَدِّيْ عَنْ نَبِيِّكَ وَ وَارِثِ عِلْمِ الْمَاضِيْنَ مِنَ الْوَصِيِّيْنَ الَّذِيْ بِبَقَآئِهِ بَقِيَتِ الدُّنْيَا وَ بِيُمْنِهِ رُزِقَ الْوَرٰي وَ بِوَجُوْدِهِ ثَبَتَتِ الْاَرْضُ وَ السَّمَآءُ وَ بِهِ يَمْلاَءُ اللهُ الْاَرْضَ قِسْطًا وَّ عَدْلاً كَمَا مُلِئَتْ ظُلْمًا وَّ جَوْرًا وَّ عَجِّلْ لَّنَا اَللَّهُمَّ ظُهُوْرَهُ اِنَّهُمْ يَرَوْنَهُ بَعِيْدًا وَ نَرَاهُ قَرِيْبًا بِرَحْمَتِكَ يَآ اَرْحَمَ الرَّاحِمِيْنَ. اَللَّهُمَّ افْتَحْ لِيْ اَبْوَابَ تَوْبَتِكَ وَ رَحْمَتِكَ وَ رِزْقِكَ الْوَاسِعِ اِنِّيْ اِلَيْكَ مِنَ الرَّاغِبِيْنَ وَ اَتْمِمْ لِيْ اِنْعَامَكَ اِنَّكَ خَيْرُ الْمُنْعِمِيْنَ اَللَّهُمَّ اجْعَلْ بَاقِيْ عُمْرِي فِيْ اَدَآءِ فَرْضِ الْجُمُعَاتِ وَ الْحَجِّ وَ الْعُمْرَةِ ابْتِغَآءِ وَجْهِكَ يَا رَبِّ الْعٰلَمِيْنَ وَ صَلَّي اللهُ عَلٰي مُحَمَّدٍ وَّ اٰلِهِ الطَّيِّبِيْنَ الطَّاهِرِيْنَ وَ السَّلاَمُ عَلَيْهِ وَ عَلَيْهِمْ. Transliteration: Bismillaahir Rah’maanir Rah’eem. Al H’amdu lillaahi rabbil a’lameen. Allaahumma lakal h’amdu badi’ as-Samaawaati wal arz” dhul jalaali wal ikraam. Rabbal arbaab wa ilaaha kulli maaloohin wa khaaliqa kulli makhlooqin was waaritha kulli shayyin laisa ka mithlihi shayyun wa huwa bi kulli shayyin muh’eet’ antal laahu laa ilaaha illallaaha illa antal ah’adul mutawah’h’idul fardul mutafarrid wa antal laahu laa ilaaha illa antal kareemul mutakarrimul a’z’eem. Was’ s’alaatu was salaamu a’laa muh’ammadin nabiyyir rah’ma, sayyidil mursaleen wa a’liyyibni Ani T’aalib sayyidil was’iyyin wa Faat’imataz Zahra sayyidatin Nisaail a’lameen wa H’asan al-mujtaba h’ujjatil laahi a’lal khalqi ajmae’e’n wal H’usainish Shaheed al Maz’loom waarithi ameeril mo-mineen wa a’liyyibnil h’usain Zainul a’abideen wa muh’ammadibni a’lyyin Baaqiri i’lmil awwaleena wal aakhireen wa Ja’faribni muh’ammad as’-S’aadiqis’ s’iddeeq wal muqtadi bi aabaaihis’ s’aalih’een wa moosabni ja’faril kaaz’im min aulaadin Nabiyyin wa a’liyyibni moosar riz”a min I’trati bararatil muttaqeen wa muh’ammadibni a’liyyil jawaadu waliyyil mo-mineen wa a’liyyibni muh’ammadis Siraajil muneer imaamil Khaashie’e’n wal h’asanabni a’liyyin sayyidil aus’iyaail muntajabeen wal khalafil qaaim al Mahdi al muntaz’ar al h’ujjati ba’da aabaaihi a’laa khalqikal muwaddi a’n nabiyyika wa waarithi I’lmil maaz”eena minal was’siyyin al ladhi bi baqaaihi baqiyatud duniya wa bi yumnihi ruziqal waraa wa bi wajoodihi thabatatil arz”u was samaa wa bihi yamlaul laahul a’rz”a qistanw wa a’dla kamaa muliat z’ulmanw wa jaura. Wa a’jjil lanaa allaahumma z’uhoorahu innahum yaraonahu bae’e’eda wa naraa ahu qareeba. Bi Rah’matika yaa ar h’amar raah’imeen. Allaahummaf tah’ li abwaaba tauba taubatika wa rah’matika wa rizqikal waasi-I’ inni ilaikum minar raaghibeen wa atmim li ina’amaka innaka khairul mun-i’meen. Allaahummaj a’l baaqi u’mri fee adaai farz”il Jumua’ati wal h’ajji wal u’mratib tighaai wajhika yaa rabbil a’lameen wa s’allallaahu a’laa muh’ammadinw wa aalihit’ t’ayyibeenat’ t’ahireen. Was salaamu a’laihi wa a’laihim. Translation: In the Name of Allah the Beneficent the Merciful. Praise be to Allah the Lord of the worlds. O Allah for You is the praise, the creator of the heavens and the earth. One with might and honor, the Lord of the lords and the deity of all deities and the creator of all that is created. He is the inheritor of everything. There is nothing like Him. And He surrounds everything. You are Allah, there is no god except You. The one, the single, the unique and the Only. And You are Allah, there is no god except You. The noble one having nobility and greatness. And bliss and salutations upon Muhammad the Prophet of mercy, the chief of the prophets. And Ali Ibne Abi Talib (a.s.), the chief of successors and Fatima Zahra, chief of the ladies of the worlds and Hasan al-Mujtaba, proof of Allah on all the creatures and Husain the martyr, the oppressed and the heir of Amirul Momineen and Ali Ibn al-Husain Zainul Abideen and Muhammad bin Ali al-Baqir, splitter of the former and latter knowledges and Ja’far bin Muhammad as-Sadiq as-Siddiq and the follower of his righteous forefathers and Musa bin Ja’far al-Kazim from the posterity of the prophets and Ali bin Musa ar-Reza from the progeny of the pious and Muhammad bin Ali al-Jawad, the guardian of the believers and Ali bin Muhammad the luminous lamp, Imam of those who show utmost humility and Hasan bin Ali the chief of the noble successors and the successor al-Qaim al-Mahdi, the awaited one, the proof after his forefathers upon Your creatures and conveyer of the message of Your prophet and heir of the past successors. By whose survival the world survives and through whose blessings all get sustenance and for the sake of whose existence, the heavens and the earth stand. Who would fill with justice and equity the world which is full of injustice and oppression. O Allah! Hasten his reappearance for us. Indeed others think him remote but we consider him near. O the most merciful of the merciful ones. For the sake of Your mercy, accept our supplications. O Allah! Open for us the doors of our repentance, Your mercy and a wide sustenance. Indeed we are inclined to You and complete Your bounty upon us, indeed You are the best of the bounty-givers. O Allah! May our remaining life be dedicated to the duties of Fridays, Hajj and Umrah and the aim of these our worship acts should be Your satisfaction alone. O Lord of all the worlds and bliss of Allah and salutations be on Hazrat Muhammad Mustafa and his pure and chaste family. Peace be on the Holy Prophet and on them. After the Friday sermons, Iqamah has to be recited and then the Imam makes intention that he is leading Friday Prayer of two rakats, wajib qurbatan ilallaah. After that he should recite Takbeeratul Ahraam. In the same way the follower should also make an intention that I am reciting the Friday Prayer behind that prayer leader of two rakats, wajib qurbatan ilallaah. Then the follower must also recite the Takbeeratul Ahraam. Allaahumma inna a’beedam min I’baadikas’ s’aalih’een qaamu bi kitaabika wa sunnati nabiyyika fajzihim ‘anna khairul jazaa. O Allah, indeed, servants from Your righteous servants stand by Your Book and practice of Your Prophet. So reward them on our behalf with the best of the rewards. After that perform the ruku and sajdahs. After the two sajdahs stand up for the second rakat and in the second rakat after Surah Fatiha recite any other Surah but it is better to recite Surah Munafiqoon. After the second Surah recite: اَللهُ اَكْبَرُ Allaahu Akbar and go into the ruku. After the ruku straighten up and recite qunoot. Then perform the sajdahs and after the two sajdahs recite the tashahud and salaam thus completing the prayer.